Earlier this month, Transcend announced the launch of 128 GB RAM kits for the new Mac Pro, offering users willing to spend nearly $2500 the ability to go beyond Apple's maximum of 64 GB. Several new options for 128 GB RAM upgrades have launched since that time, offering consumer more choices in sourcing their RAM. Last week, MacMall began selling 32 GB modules from Axiom for $620, thus matching Transcend's $2480 price for the full 128 GB kit. And today, OWC announced its own kit, offering the full 128 GB for $2130, a savings of $350 over Transcend and Axiom for the time being. As with all of the other 128 GB kits, OWC's will run at 1066 MHz due to limitations in Intel's chipset for addressing the higher capacity of RAM. Lower-capacity RAM kits can run at faster 1866 MHz speeds, but OWC notes that the performance hit of the 128 GB kit is generally minor compared to the benefit of having much more RAM. While current DRAM device technology limit 32GB modules to a 1066MHz memory clock in the Apple Mac Pro 2013, due to enhanced CAS Performance of OWC MaxRAM 32GB Modules, actual real-world performance is insignificant in low memory need scenarios while offering incredibly significant performance gains in all cases where application use benefits from greater than 64GB of total memory installed. In addition to its new kits of 32 GB modules, OWC also offers RAM kits for the Mac Pro using 8 GB and 16 GB modules at much lower pricing than through Apple. As a result, customers may prefer to order their Mac Pro from Apple with a minimum of RAM and save some money by upgrading the RAM through OWC or another vendor offering high-quality RAM for lower prices than at Apple. Really, who needs 128GB of RAM? Oh please. No one will ever need more than 640 KB of RAM. My first computer hard drive was 10GB. I love technology. Young'un. Mine was 40 MB. And I'm sure there's lots of people here who can beat that by a lot. The question is how long before there's a Mac Pro in every home? The technology continues to advance but consumers aren't keeping up so far. Um...what? I'm a little confused. Most people will never need that much RAM. You might as well ask when everyone will have a Formula 1 car parked in their garage. What is big and fast enough? I started at 5 MB in disk space and I now have a single drive with 4TB (and a lot of other drives too). No matter what we do, the technology will outstrip our ability to really believe what can happen. If I had the computer power, memory and space that is in my iPhone 5s, my masters work in physics would have gone so much faster. I would not have believed ANYONE if they told me that a phone would faster than a VAX 11/780 in 30 years. I have a 2008 MacPro that I keep updating and updating; RAM, SSDs, graphics cards. No, I can't match the new one, but I still do 3D rendering for CAD, Aperture, PS6 and a lot more. I drool for a new MapcPro. When I do buy it I will have it for, what, 10 years, before it can't keep up, and who knows what add-ins will be available to allow it to keep up? Apple makes it easy to keep machines forever. The only reason I don't crank up the Mac II is that I can't find the monitor for it. I want to show my god children what pre-historic looked like. Agree, it's hard to judge and say what is fair for the price for these Mac Pro's. As most of us have no idea what the production costs are. I almost want to say that at the price of point $3,000 it really isn't that "not bad" for what it is offering (I recall my best friend's new computer almost 10+ years ago was $2000). But at the same time, because it really isn't that cheap, one starts to think about price vs. actual usage. Giving that a Mac Mini for $550+ can do everything I need, is it really worth it to spend the extra money (let's keep this to regular family/tech savvy consumers). 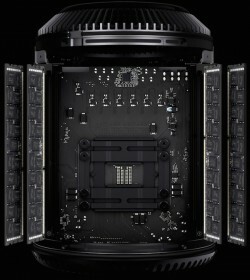 I think, if Apple is really to put this out for $2000-2500, I think that might be a decent price for these Mac Pros. Then again, I honestly don't see that happening. This is simply not a machine for home use. This is for PROS. Meaning, people who actually make money from their computer workstations. If an upgrade makes you more money, then it's worth it. Otherwise, keep using what you already have. Mine was in the megabytes I can't remember how big though. RIGHT NOW it's like having an F1 car but it wasn't long ago that I looked at the Mac Pro with 16gb of ram and thought that no home user would ever want or need that. That was 2007, today 16gb or ram is not that insane. It's hard to imagine it right now though, but give it 10 or 15 years.